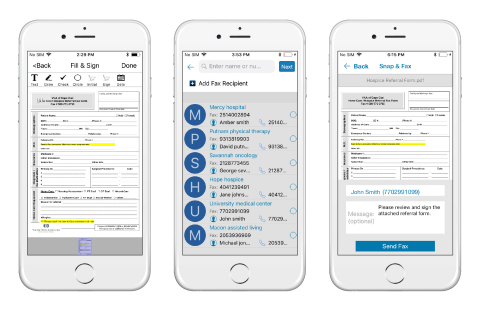 The secure messaging platform provider QliqSOFT has launched a new clinical collaboration solution that allows physicians and nurses to integrate their current medical fax solution into their daily mobile-focused workflow. Faxing may now be an antiquated method of communication, but faxes are still extensively used in healthcare to send important patient information and are an integral part of healthcare workflows. While alternative communications services have been widely adopted in other industries, faxing still accounts for approximately three quarters of all medical communications in healthcare. The new QliqSOFT service, named Snap & Fax, brings faxing into the modern era. The service allows healthcare professionals to quickly create and fax documents directly from their mobile phones using the Qliq secure texting mobile app. The new service provides the same functions of traditional fax machines with the added convenience of sending documents directly from mobile devices and not having to print out or scan documents. The solution is based on QliqSOFT’s Snap & Sign architecture, which allows e-signatures to be quickly and easily added to images captured on mobile phones and PDF files. Since all communications are encrypted and the app has robust access controls and an audit trail is maintained, the service is fully compliant with HIPAA regulations. In contrast to a fax machine, where mis-faxing can easily occur, the Snap & Fax service only permits messages to be sent to a pre-built list of contacts. This not only eliminates user error, but also expedites processing, review, and approval. The service allows messages to be retrieved directly from hospitals’ fax servers and faxes to be created and viewed anywhere with mobile coverage. In addition to making faxing more efficient and convenient in hospitals, the service is ideal for home health providers, allowing field clinicians to send and receive faxes directly from their smartphones. Vital information such as test results and patient records can be sent and received in the shortest possible time frame. Documents can be quickly created from captured images and PDF files can be easily shared with all members of the care team, other healthcare providers, and business associates. Snap & Fax removes the burden of clinicians who are still required to track down an available and reliable fax machine to share these important documents with relevant parties,” said Krishna Kurapati, Founder and CEO of QliqSOFT.